Twenty years ago this month if you were using a Windows PC then it was probably the new fangled Windows 95 (launched 1995) or clunky Windows 3.1 (launched 1992). But popular as these operating systems were, they were ultimately a dead-end as Microsoft continued to develop its new Windows NT platform which reached a significant milestone in August 1996 with the general release of Windows NT 4.0. Although Windows 3.1 and 95 were popular, fundamentally they were a horrible kludge built on top of Microsoft's ancient MS-DOS operating system. Although Windows 95 looked good, underneath everything was creaking and the whole edifice had a tendency to fall over. Often. While this was perhaps acceptable for home users, it certainly didn't equate to the stable and reliable systems needed for business. Windows NT had been developed in parallel with the consumer versions of Windows and despite sharing a similar interface to consumer versions, it was fundamentally a different operating system underneath. Designed to be a modern operating system, it was a full 32-bit affair with proper multitasking, multiuser capabilities, security, multiprocessor support and the ability to run on a range of different processors rather than just Intel. Inspired more by the operating systems on mainframes and minicomputers (especially VMS), Windows NT could potentially run anything at more-or-less any scale that you wanted. The initial versions of Windows NT had a Windows 3.1-style interface and made very little impact on the corporate desktop world (although they started to make inroads into the server market). 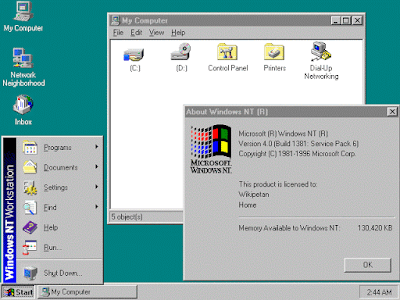 But Windows NT 4.0 was much improved and perhaps most importantly it came with a Windows 95-style interface that made it very usable and modern. Along with proper networking support and authentication handling, system policies and the potential for rock-steady reliability on the right hardware it rapidly became the standard operating system for larger businesses. One major problem was that Windows NT 4.0 was essentially a server operating system shoehorned into a desktop. There was no plug-and-play support for peripherals, and NT 4.0 never supported USB either and hardware support overall was limited. Although these limitations were OK on the fleets of Compaq, HP and Dell machines corporates were using, it made for a pretty unsatisfying experience on a laptop. Laptop users really struggled with unplugging or plugging in anything reliably with Windows NT 4.0, but users with Windows 95 and the much improved Windows 98 could do these things with ease.. they could also use new-fangled things such as USB peripherals and even WiFi. With laptop market share growing rapidly, it was clear that NT 4.0 didn't cut the mustard. The next version of Windows NT was Windows 2000 (launched in 2000) which was still aimed at business customers, and this fixed many of the issues. Internally, 2000 was known as "version 5.0", retaining the NT versioning internally. But it was the next version that made all the difference, Windows XP ("version 5.1") which made a huge impact and finally united the consumer and business versions of Windows together (the final successor to Windows 95 was the awful Windows ME). Today's Windows 10 operating system is still based on Windows NT, and although the interface has gone through radical changes over the years, it still retains the solid foundations that NT 4.0 introduced. And although perhaps not the best-loved Microsoft operating system, it is probably one of the most important.